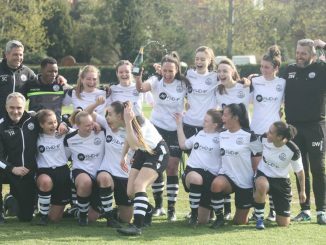 Ashford Town were the one change in divisional leaders on 17 March, Kent Football United won a top of the table clash in dramatic fashion, while cup final places were booked by Ashford LFC, Moneyfields, Ossett United and Shifnal Town. PREMIER – Cambridge City went 13 points clear with a 3-1 win at Brentwood Town, where Shannon Shaw bagged a brace. Wymondham Town beat Peterborough Northern Star 3-0 to go second, as Royston Town slipped to a 2-0 reverse at Harlow Town. 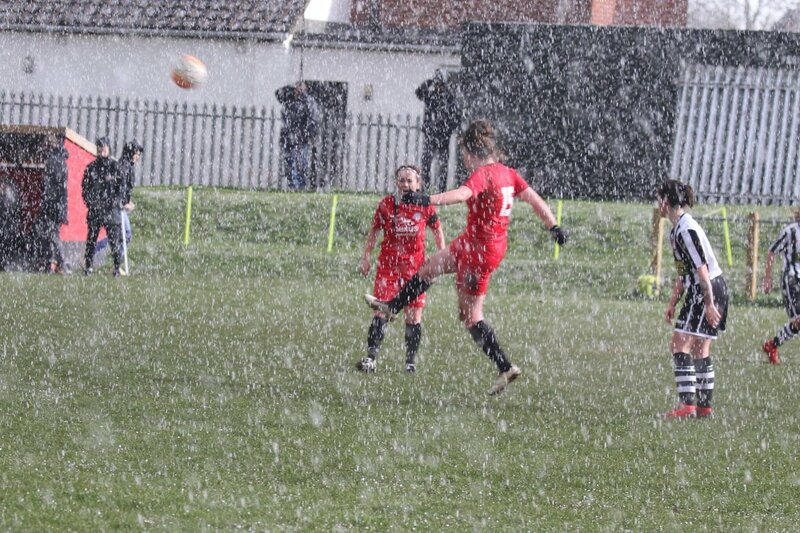 Acle United versus Colney Heath was abandoned. ONE – Hoddesdon Town Owls’ Rosy Wodhams got a couple in a good 5-2 result at Hutton, a Jasmine Cox double earned Hatfield Peverel a point against third-placed Newmarket Town. King’s Lynn Town won 3-2 at Hertford Town, Histon beat Bishops Stortford 2-0 and Stevenage Reserves’ game with Lawford was another to be cut short. PREMIER – Leicester City WFC Development stayed top with a 4-2 victory at Ollerton Town, Peterborough United are still a point behind after defeating Oughtibridge 3-1. Kettering Town’s Laura Beckett bagged a brace in a 5-3 win at Eastwood. 1 SOUTH – Oadby & Wigston moved two points clear with as many goals against Loughborough Foxes Vixens, Thrapston Town took their very first points with a single goal at Corby Town. PREMIER – Kent Football United are only four points behind leaders AFC Phoenix with three games in hand, having beaten them 2-1 away despite red cards for both Shannon Burden and Megan Burrows. Chloe Sampson scored twice in the last 10 minutes to give QPR Girls Development a 2-0 result at Fulham. GREATER LONDON PREMIER – Ashford Town (Middlesex) are top following Lavana Neufville’s six goals in the 7-1 result over Regents Park Rangers. JOHN GREENACRE MEMORIAL TROPHY 3RD RD – New London Lionesses pipped Godalming Town on penalties after they finished deadlocked at 1-1. SOUTH EAST COUNTIES PREMIER – Lewes Foundation’s Maya Beesley got both goals in the game with Meridian. LEAGUE CUP S/F – Rebecca Wyatt got five of the six goals as Ashford Ladies reached the final with victory at Burgess Hill Town. PREMIER – Durham Cestria are one win away from a perfect league campaign following their 3-0 defeat of Farsley Celtic. 1 NORTH – Norton & Stockton Ancients Reserves gained ground on fourth-placed Washington, Louise Atkinson wit a double in a 4-2 away win. 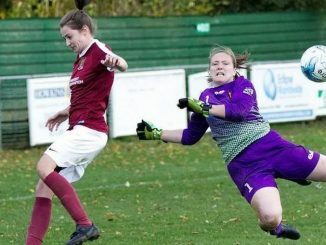 Cramlington United could not avoid a seventeenth straight defeat despite leading at half time, with Prudhoe Town replying twice through Samantha Garcia. 1 SOUTH – Sheffield Wednesday’s Emily Higgins netted two of the Owls’ three goals at Barnsley Development, Altofts edged Harrogate Railway 3-2 away. LEAGUE CUP – Ossett United reached the final after a 3-0 success at York City, Hartlepool United are into the semis with a 5-0 win at Boro Rangers, Caitlin Bates and Justine Robinson with two apiece. PREMIER – Merseyrail scored five times in the eight-goal game against Sir Tom Finney, three of those from Shelley James. 1 NORTH – Blackburn CSC hit Penwortham Town for six to rise two places to second, four points short of Blackpool with a game in hand. PREMIER – AFC Bournemouth are three points clear after a 3-1 scoreline at home to Oxford City, all the Cherries’ goals coming before the break. The basement battle between New Milton Town and Barton Rovers ended 2-2. ONE – Substitute Molly Lygo-Jackson got one of three braces as Abingdon United went second when walloping Wargrave 8-1. Eastleigh’s Samantha Hide hit a 23-minute hat-trick in beating Shanklin 3-1, while Basingstoke Town won by the same scoreline at Wokingham & Emmbrook. 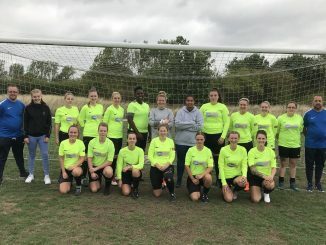 CHAIRMAN’S CUP S/F – First-half goals by Kim Whitcombe and Sheree Bell-Jack set up a 2-1 success for Moneyfields over Warsash Wasps to book a place in the final. 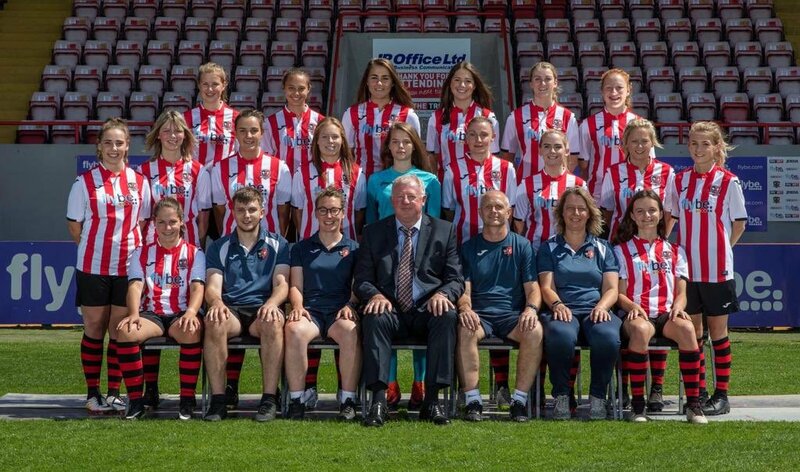 PREMIER – Exeter City closed in on leaders Keynsham Town Development as Sian Chapman and Sophie Gillies struck twice each in a 6-1 success at Torquay United, however the Grecians lost Emily Toogood with a fractured collarbone. Portishead also put six past Forest Green Rovers, Marine Academy Plymouth netted four of the game’s six goals at Ilminster Town and Middlezoy got three goals and three points at Downend Flyers. 1 EASTERN – Swindon Town Development drew 1-1 with AEK Boco, Sophie Barrett on target for the former, Shania Powell for the latter. 1 WESTERN – Samantha Metters featured with five goals as Plympton posted a 6-1 score over Alphington, Weston Mendip’s Sherise Binns also had a five-star performance in an 11-0 win at Exeter & Tedburn Rangers. PREMIER CUP Q/Fs – Redditch United progressed past Goldenhill Wanderers 8-2 with a hat-trick by Jade Guppy, while Leafield Athletic knocked out Stockingford AA Pavilion 3-1 after extra-time. 1 NORTH – Wyrley edged Sandwell by the odd goal in seven, Shifnal Town got through to the Divisional Cup final by eliminating Stoke City Development 2-1. 1 SOUTH – Solihull United made it fourteen wins on the trot by sinking Kingfisher 7-0, Hayley Wilford netting four and Cat Harris a couple.